Through the course of our lives, we come across a lot of people. Some of them we remember, some of them are part of our life, some of them are really close to us while some we tend to forget. But one thing is constant that is the end of one’s life. Death is evident for all human beings and that is one of the biggest truths of our lives. We all have that someone in our life whom we have lost and miss dearly but do not know how to express it. Remembrance ads in newspapers are published to convey an individual’s feelings, condolences and respects towards a deceased family member or a close friend. A considerable number of people, especially distant relatives and friends or associates of the deceased individual, often convey their condolences and tributes through Death Anniversary Wishes. In these messages, the advertiser can express their grief, the duration of their association with the deceased, relationship with the deceased, the contribution of the deceased, if any, in their lives and anything else that they may find worth mentioning. 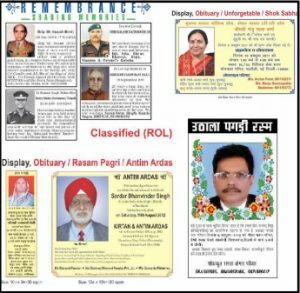 Death Anniversary ads are booked in three different formats in the newspaper which includes classified text, classified display and displays. Classified texts are simple running text ads charged on the basis of per lines, words or characters used in the ad content. On the other hand, classified display and display ads are known as column ads charged on the basis of per square centimetre unit. You can use photos, images or graphics along with text in these ad formats. For reference, you can check remembrance advertisement sample online through our portal. releaseMyAd was founded in 2008 with the idea of booking classified ads online in national and local newspapers of India. With the aim to make advertising easy for the clients, we brought the entire marketplace at your fingertips enabling the advertisers to choose from a wide range of options to fulfil their advertising goals. Our portal is designed in such a way so that anyone can book their ads without our help. Even if you face any kind of problem while booking, our executives will assist you. releaseMyAd simplifies your advertising experience by saving time and money. It eliminates the hectic process that one has to go through earlier. We are authorized by INS, the main governing council of media publications, so the publication house sends us direct ad rates without any extra commission charge. releaseMyAd contact information: In case you find any difficulty in booking the remembrance ad, feel free to call us at 09830629298 or write us at book@releasemyad.com. Our executives will get back to you within 24 hours.